The Palestinian Prisoners’ Club (PPC) said on Wednesday said that the Palestinian journalist-writer Lama Khater, arrested by Israeli forces early on Tuesday morning, is being interrogated in a brutal, inhuman manner. According to them, Ms. Khater is being held at the Israeli prison Ashkelon. The PPC, in a statement on Facebook, said that its lawyer, Firas Al-Sabbah visited Khater in the prison. It also said that Khater’s well-being and safety was the responsibility of the prison authorities. They demanded her immediate release. Israeli forces had arrested the 42-year-old journalist and writer from her home early on Tuesday, along with at least 13 others in multiple raids in the West Bank. 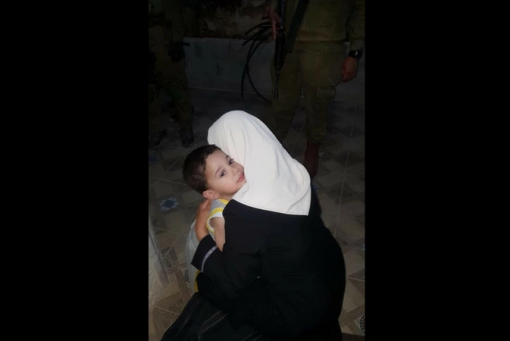 She was taken away from her family by at least 25 Israeli soldiers around 2 am on Tuesday morning. Heart-rending images of Lama hugging, kissing and saying goodbye to her two-year-old son, Yahya, before her arrest went viral on social media. The photos were taken by Lama’s older daughter, Besan, who posted them on Facebook. The 14 Palestinians were held on charges of alleged “hostile” activities against Israeli soldiers and settlers. Lama, who has more than 87,000 followers on Twitter, is known for her writings, which are heavily critical of the Israeli occupation, as well as the Palestinian Authority. Lama had criticised the Israeli and Egyptian closures of Gaza crossings in her most recent writings.She had also condemned Israel taking control of the Al-Aqsa Mosque in occupied East Jerusalem. According to the Palestinian prisoners’ rights group Addameer, at least 5,900 Palestinians were detained by Israel as of June, 60 of whom were women and girls.